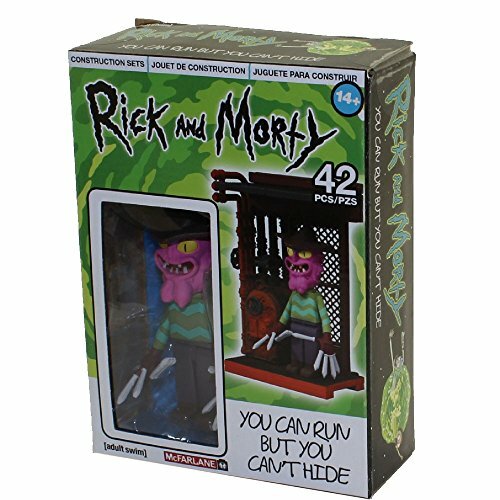 Construction set features a buildable scary terry figure and boiler room setting based off iconic scenery from "Rick and morty"
ABOUT RICK AND MORTY: Rick and Marty is a half-hour animated hit comedy series that airs on Adult Swim. Created and executive produced by Dan Harmon (Community) and Justin Roiland (Adventure Time), the critically-acclaimed series follows a sociopathic genius scientist who drags his inherently timid grandson on insanely dangerous adventures across the universe. Rick Sanchez (Justin Roiland) is living with his daughter Beth's (Sarah Chalke) family and constantly bringing her, his son-in-law Jerry (Chris Parnell), grand-daughter Summer (Spencer Grammar) and grand-son Marty (Justin Roiland) into intergalactic escapades. Can the family survive Rick's insanity and all the chaos the universe throws at them? The much-anticipated third season of Rick and Marty is currently in production. ABOUT YOU CAN RUN BUT YOU CAN'T HIDE SET: A "legally-safe knockoff of an 80s horror character with miniature swords for fingers instead of knives," Scary Terry infiltrates the dreams of people in attempt to scare, terrify and destroy them with real life consequences. ABOUT MCFARLANE CONSTRUCTION SETS: McFarlane Toys is bringing a revolutionary evolution in brick building toys that allows collectors and fans to literally build their favorite scenes with these highly detailed and realistic construction line. Each set brings immaculate detail, iconic environments, and convincing sculpts, all at an unpredicted size. Add multiple characters to your scenes, combine builds, or just enjoy your awesome creations on its own.